Updated February 1st 2019: Hello and welcome to our website, a lengthy tale of travel, wanderlust, adventure and companionship that spans 5 decades. My name is Trevor McGrath and that cheeky face pictured beside me is Wendy, wife & soul mate. Australian born and raised, we now live in Canada and continue to broaden our travel horizons and this website, will attempt to cover some of our 54 yr. travels; developing the site has become a task at times, but we hope that those who discover it, will draw incentive from our story to see more of this gifted planet we live on. Perhaps Saint Augustine put it better than us when he said "The world is a book, and those who do not travel read only one page." Love to hear from kindred spirits; click on "ABOUT US" in the blue Menu Bar for a "Contact us" page; speaking of pages, the main headings in the Menu Bar are themselves individual pages viewed separately from other pages that appear in the Drop Down page list. There is a great deal to read and see on this website, after all, we are dealing with the World here. For detail on some of our early travels and in chronological order, we would suggest you click on the "Continue" button at the end of this page and after you have made your way through "The Three of Us", it will have set the stage for the many other facets of this website. There is much to see here and we are adding to it all the time such as our 3 newest additions "Window on the World" parts 1 & 2 and the U.S.A./ CANADA (NOW COMPLETE). "W.O.T.W" 1&2 are a work in progress but there is still lots to see. Please read on for a general synopsis of our worldwide travels which are outlined in greater detail later. FOR ME, ANY MEAL WITHOUT A GOOD GLASS OF WINE IS UNTHINKABLE. ​​I have spent many hours creating the pages on this website and for me, currently using Windows 7, they all load and work fine according to the directions given for viewing but my advice may NOT apply to you because there is no way I can know what computer, iPad, Notebook, monitor, browser or operating system you are using and heaven forbid if you are using a Smartphone, that will likely reduce my full page photos to the size of a postage stamp. On my 21 inch PC monitor and 29 inch iMac screen, everything works and looks as it should. This very much improved website has replaced "20yearsoverland.com" which was originally created as an information reference for the online auction of our VW hi-topped, self renovated camper pictured several times on this page; it has since been sold and we will journey in it no more, a sad thought indeed but its history will carry on through this website relating a story long waiting to be told. I refer to an epic 20 yr. worldwide journey in which my wife Wendy and I tested human companionship to its maximum extent; after all, how many couples, married or otherwise, have saved one another's lives several times? And that's just a drop in an ocean of other stories, yet untold but not forgotten; stories that began with the purchase in London of "Roadranger" (RR1) pictured on the left at Las Vegas. Wendy is shown below in RR1's interior; closet and toilet are in the rear; up front on her left, lounge cushions coupled together to make a soft, very comfortable 6x7 ft bed; behind her, one half of that counter-top lifted up to access a four burner stove with oven and a refrigerator is behind doors o beside it. 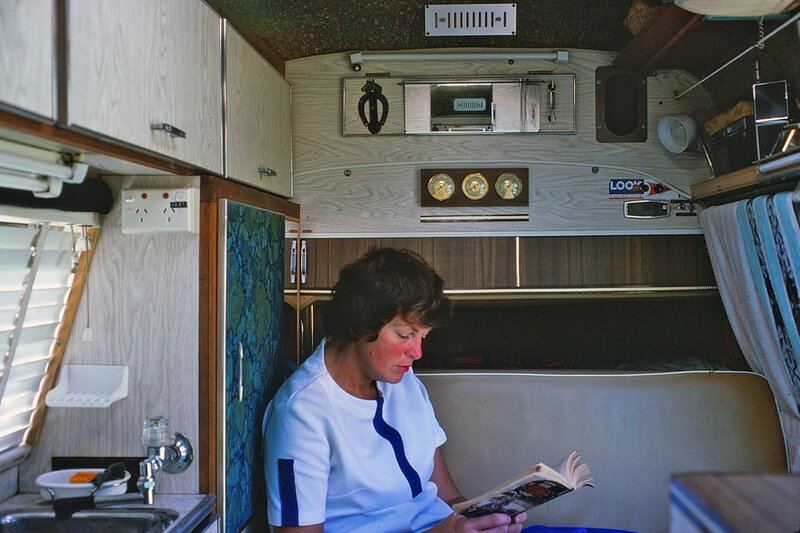 RR1 was a quality, English-made motor home built by Jennings on a "Commer PB-1500" chassis. 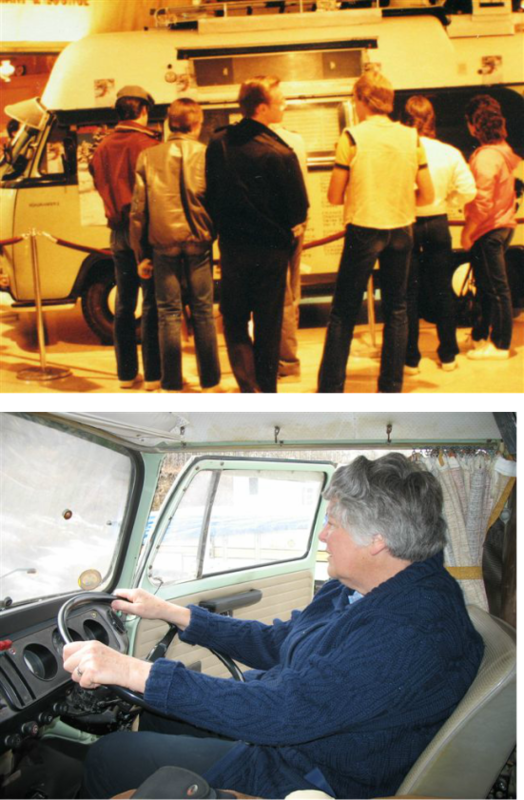 Wendy & I lived permanently for many years in our own custom designed VW camper shown on the right and the below photo shows Wendy in the rear of the vehicle. We christened our VW camper "Roadranger 2" (RR2). During our first 3 years of travel, we lived in the original "Roadranger" which we later sold in the USA. "Roadranger (1) & RR2" were our permanent homes as we explored all continents of the world barring of course, the Antarctic. Shipping the vehicles some 68 times overall, we explored some 170 countries, travelling well over a million kilometers on land and destroying 72 tires in the process; RR2 did most of the work and wore out 4 engines. Many islands were explored independently without RR2 which finally ended up in Alberta, where we kept using it to explore Canada from Newfoundland to Vancouver Island and everything in between. Canada being a snow prone country, the many ski resort names we had hand painted on the passenger side body, created a lot of interest among skiers we encountered along the way; indeed, everywhere in the world really. Selling our VW in Alberta was a truly sad event because our beloved RR2 got us out of some hazardous, life saving situations over the years; it had become the child we never found the time to have.......C'est la vie! But before I get too far into the travel theme of this website, a little more background on ourselves may be in order. Sydney born and raised, Wendy taught physical education for several years in N.S.W. and then moved on to lecture at Goulburn Teacher's College. In her time, she has coached volleyball, basket-ball, swimming, field hockey, gymnastics and played squash and tennis at competition level. Born in Cairns Queensland, I am bush raised with a very nomadic up-bringing and there is a drop-down link under the "On the Trail" Menu page that will lead you to "My Childhood Days" and growing up in early days Australia. 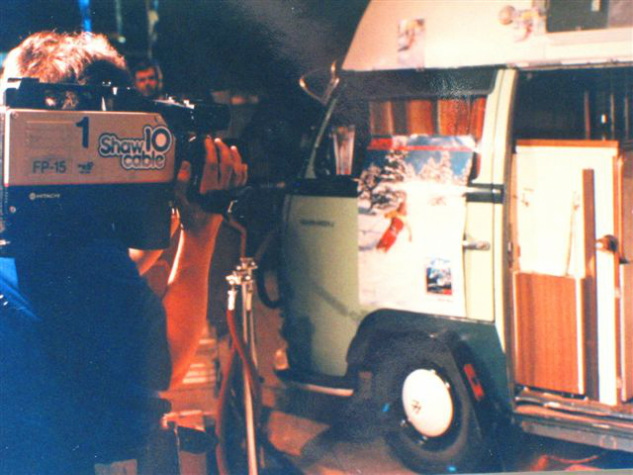 Later, in Nowra N.S.W., I attended college and studied electronics which led me to the field servicing of colour TV's and audio. Like Wendy, I enjoyed squash and tennis but also, foil fencing and competed under the trained eye of an Olympian. Our Volkswagen attracted a great deal of attention wherever it roamed because of the highly detailed world map of our travels we hand painted on RR2; having to maintain this artwork, turned out to be a "labour of love" but when it came to meeting the locals, it proved to be a valuable asset . From Prudhoe Bay, Alaska to Ushuaia, Argentina; from Denpasar, Indonesia to London, England; from Iceland to the Cape of Good Hope, Sth. 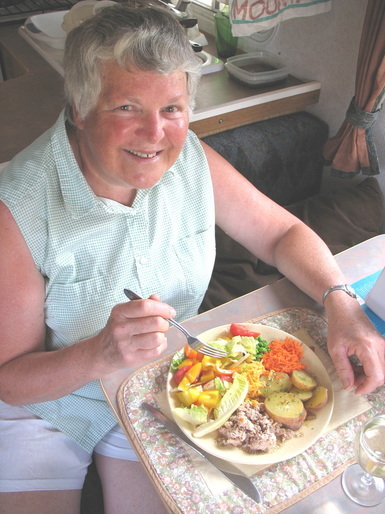 Africa and from Cape York, Australia to Bluff, New Zealand our nomadic lifestyle was regularly the main topic of conversation between us and citizens of the world, often at their dinner table after an invite, check out our "People Moments" page. RR2 also attracted attention from the media wherever we travelled around the world. It was unique in every way with its exterior design and shape, interior setup, and the many, innovations that experience prompted us to add to it over the years. For example, on our arrival by sea in New York, it was featured on CBS "Good Morning America" and also in the "Long Island Times." After that, RR2 and its history went National on other American & Canadian radio, TV programs, ski magazines and newspapers. Whether being interviewed by the media or chatting with the locals, we were never short on conversation for there were many stories attached to the maintenance of RR2; one of them being that since the initial Australian warranty expired, no one other than myself ever worked on the vehicle and it was on its fifth engine when sold! While in possession of RR2 and during that time, I must have replaced just about every part of the vehicle, often in less than ideal conditions. Ever tried replacing a seized velocity joint while lying in snow melt on a mountain pass, (see our "Life on the Road" page). Or how about changing a wheel bearing with lions nearby & your wife on shotgun guard; or having to remove an engine with the vehicle parked on sand? Those were the days and the isolation of the S.W. Saharan desert, (pictured above), well depicts the fact that regardless of the problem, you must be able to fix your vehicle wherever you may break down because if you leave it to get help, it will likely be stripped if you indeed make it back. And forget about leaving your wife there to watch the vehicle, she'll be the first to disappear. And what led us to settle in frost bitten Canada when we could have returned to our temperate home country? Having skied at almost every well known snow resort world-wide, including some unlikely places like Morocco, Lebanon, Turkey, Iran, South Africa & India, we decided to settle in a city an hour's drive from the best skiing in the Rockies, which made a whole lot of sense to us. The fact that a Canadian Rocky mountain ski resort manager offered us free skiing, meals, uniforms & mountain accommodation if we allowed him to use our vehicle to promote his resort, also helped as well. RR2 (left), attracted much interest in the largest mall in North America, located in Edmonton, Alberta. One of the things that we now miss about RR2 is the right hand drive. There were advantages in having the steering wheel on that side in North America; for one thing, parallel parking was a breeze and on the highway, you sure knew where the road shoulder was. As a result, RR2 tended to travel further away from the center line than left hand drive vehicles and that was a whole lot safer. We also miss the startled look on people's faces when they realized, as we passed them by, that the vehicle appeared to have no driver. Kids were the funniest and would come up with comments like .......... "hey mom, look at that funny rig!" LEFT: RR2 shown in outside storage before the eBay auction. 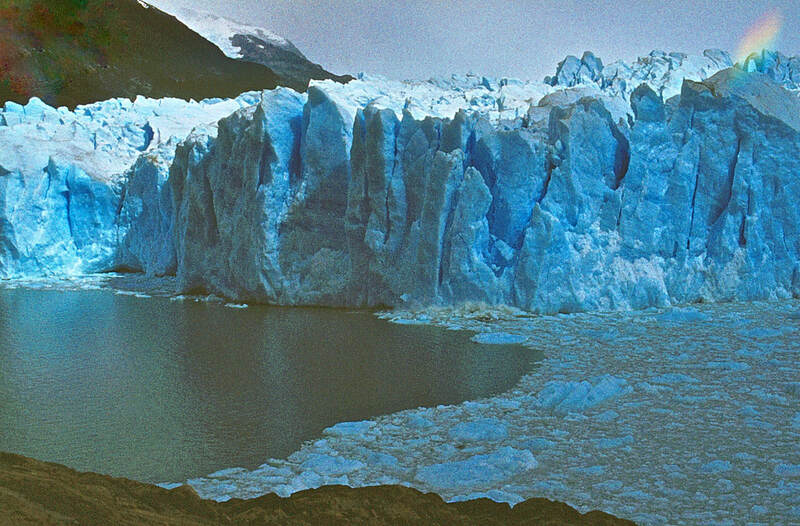 Right: Wendy tackles a treacherous ice flow in "Close Calls." In preparation for the sale of RR2 seen above in storage, we put together two slideshows detailing the many features of this unique vehicle. We have left these slideshows on the this website because many of the additional features pictured therein, came into being through experiences that may be of interest to any VW enthusiast who may visit our site. Look for "RR2 Exterior" & "RR2 Interior" pages to become more familiar with the home we lived in for over a decade. If you're not that interested in VW campers, check out our "Guess Where" page for a synopsis account of some of RR2's world wide journeys with a built in test of your geography knowledge as well. For an armchair roam around the world, we scanned pages from one of our travel albums and created a PDF file that you can page through. We hope you'll enjoy our "The Three Of Us" album which provides far more detail of our travel experiences and coupled with that, our "Life on the Road," page introduces you to what independent Overlanders have to face at times in their daily lives. Yes we did start on a book but alas, never finished it and our "Close Calls" page features two excerpts from it. It firstly relates an experience where we came close to losing our precious RR2 in wintry weather in England of all places and still in England, our lives as well, on an ice covered, windswept plateau (above right); both are examples where Mother Nature can become your main adversary. Rather than stay with the book, we chose to do audio-visual shows on our travels instead and carried that idea on for 10 years and I will have a lot more to say about those shows in the "Three Of Us" album. Both Wendy and I agree that many of our highlights while travelling, often included meeting people, especially the locals and our "People Moments" page recalls some of those events, perhaps our favourite section on this website. Our "Memories" page, being added to all the time, runs a close second to that as we recount some of the memorable events associated with selected pictures placed in a photo gallery; it well indicates that there can be much more to a single photo than what meets the eye. An Australian, 8 week, east coast tour in a hired Mercedes "Ventura." 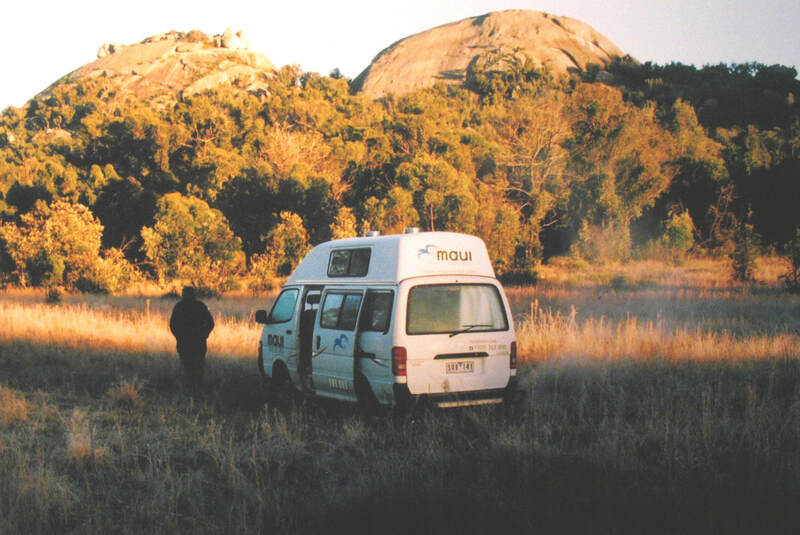 Wendy, (above) keeping her hands in her parka pockets, steps out of our rented "Hi-Ace" motor home to enjoy the freshness of a frosty morning in Girraween Nat. Park, Queensland, Australia. As you can see, our travels are continuing as we age well past many of the travel moments depicted on this website. We have enjoyed several return trips to Australia renting motor-homes and the internet has allowed us to plan independent sojourns into parts of the globe we had yet to visit although that list is getting very small. We also managed several visits to Hong Kong and a return trip to China, (first visited in 2012). Our second time in China included journeying to Tibet and boat trips on the Yangtze and Li Rivers. Other trips have taken us to Indo China including Vietnam and Cambodia with some 7 days on the Mekong, one of the great rivers of the world. Time spent in "The United Arab Emirates" carried us to Dubai and with only a few months respite, we flew to and explored South Korea and later, revisited Japan More recently we travelled the Trans Siberian Railway across Russia, a marathon task in itself through 9 time zones and covering over 6000kms between Vladivostok and Saint Petersburg. On our last trip, we ventured on to the Mongolian Steppes and spent some time with Mongolian Nomads. Check out our "Asian Insights"​ ​page for much more detail on these latest Travels. Our countries visited have now climbed to over 175 and that will provide even more to add to our "People Moments" and "Memories" pages when time allows. Antarctica awaits us in January 2020. Just added a recently restored article from our early travel memorabilia dealing with a life or death experience that Wendy and I had to deal with; check out "Beautiful but Deadly" under the "On the Trail" drop down Menu heading. A note for those interested in photography! Many pictures on this website, particularly when dealing with our early travels, are scanned 4 x 6 PRINTS selected from our scrapbooks. Yes, we should have scanned the original 35mm, Kodachrome slide but alas, they were misplaced after the prints were made while on the road. Many of those prints were processed in laboratories operating with poor air quality control resulting in dust particles being re-produced on the prints; these particles are not so obvious in the 4x6 prints but are more noticeable in any enlarged versions, sorry folks but the end result I feel is acceptable. From about the year 2010, once we moved into SE Asia, our older Canon 35mm equipment was replaced with Canon digital and that problem was solved. However, I have been scanning what 35mm slides I do have and putting them into a new "Window on the World" series and also in "Memorable Campsites"; even at 1200 DPI, the difference is remarkable for slides as old as they are, all taken with a Canon F1 SLR. For example, check out Iceland in Window on the World (2) and New Zealand in W.O.W. (1).